To understand what it meant to be a Hathaway you d first have to see Aurelia. For generations, a grand estate house was the crowning glory of over three thousand acres of Iowa farm land and golden corn fields. Named Aurelia, it was a monument to matriarch Lavinia Hathaway s dream to elevate the family name no matter what relative or stranger she had to destroy in the process. It was a desperation that wrought the downfall of the Hathaways and the once prosperous farm. Now the last inhabitant of the decaying old home has died alone. None of the surviving members of the Hathaway dynasty want anything to do with the house, the land or the memories. Especially Meredith Pincetti. Now living in New York City, for seventeen years Lavinia s youngest grandchild has tried to forget everything about her family and her past. But with the receipt of a pleading letter, Meredith is again thrust into conflict with the legacy which destroyed her family s once-great name. Back at Aurelia, Meredith must confront the rise and fall of the Hathaway family…and her own part in their mottled history. A beautifully written, gripping tale...This is an atmospheric portrait of a family in crisis, a novel with a gothic feel that is full of fascinating detail and a great sense of place and one that I can’t recommend highly enough. It is wonderfully plotted and paced and a complete pleasure to read. Utterly gripping, Davy’s effortless story-telling style reels you in from page one, and soon you’ll find yourself absorbed in the shockingly amoral machinations of Lavinia and the monster she creates. Think The Long Song meets Gone With The Wind, if you’re a fan of juicy, epic family sagas this will be right up your street. It would be fallacy as much as cliché to describe Ms Davy as a star of the future as The Legacy of Eden shows, she is a talent who is already very much here. 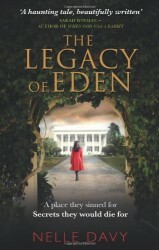 Combine Daphne DuMaurier with Jane Smiley, and you'll get The Legacy of Eden. This dark tale of a golden farm family is a wonderfully Gothic read.